Search procedure can be helpful when you've completed QuickScan for the particular volumes and you are not able to locate your files, or you can not assume the location. Before using any recovery software, including Active@ File Recovery, check the Recycle Bin to see if the deleted file or folder is there. If it is, use the standard Windows Restore command to recover your data from there. If you cannot find the file or folder you are looking for in the Recycle Bin, continue with search and recovery procedures. After the Search is complete, examine the Search virtual folder. This is a flat list of all items satisfying your criteria. You can sort Search results on any column (name, size, date, ...), check properties of items, preview and recover files and folders. SuperScan inspects existing volumes more deeply. For example, if you formatted the volume, QuickScan displays no files on it. However SuperScan most likely will detect formatted data structures and will reconstruct previous data tree. 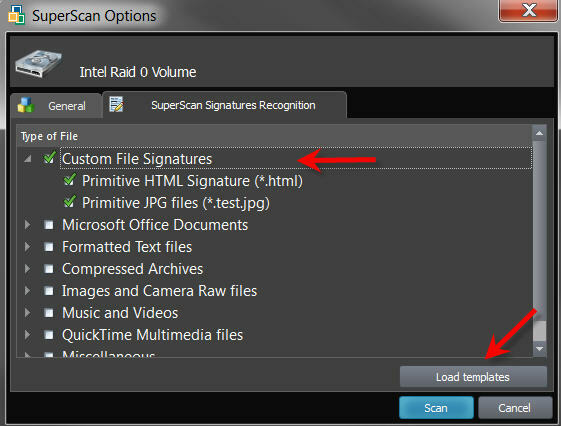 SuperScan has an option of detecting deleted files by their signatures. More than 50 predefined file signatures have been implemented internally (MP3, JPG, DOC, ZIP, etc..) and there is an option to create and load custom signatures from template files. This can happen when a lot of writing operations occur on the drive, for example during a software installation. As well, Windows operating system will sometimes create temporary files for different processes. If the process involves a lot of data and many temporary files are written, your deleted files may have been destroyed. When you are using a search pattern in Search, it is the same pattern recognized when searching in Microsoft Windows.The asterisk symbol (*) in the pattern means that at this place can be zero or any number of any symbols.